Underneath our feet, below the Earth's surface invisible to us, but vital for our needs is groundwater. It is a major source of drinking water in Europe and plays an important role in several aquatic and terrestrial ecosystems. In Germany alone groundwater accounts for two thirds of drinking water. Groundwater however is not lifeless, it contains at least 2 000 known species and numerous microorganisms which help to clean the groundwater and improve the quality of drinking water. Despite its importance, both to us and the ecosystem as a whole, its protection has not yet been established in law. The study was presented in Nature Scientific Reports. This situation is set to be overturned by the Institute for Environmental Sciences of the University of Koblenz-Landau which has presented a draft for the geographical classification of groundwater fauna. This draft aims to establish suitable measures for the sustainable, ecologically-oriented management of groundwater, and could potentially be used as an important step for evaluation of the environmental status of groundwater. Groundwater in Europe is a vibrant ecosystem with approximately 2 000 highly adapted, and in some instances very rare, species such as turbellaria, rotifiers, water mites, fresh water amphipods and olms. As such, groundwater is considered by many to provide one of the largest continental and oldest habitats in Europe. And the species provide us with vital services; the species-rich bacteria and fauna clean the water in the subsoil by decomposing organic material which has fallen from the surface to the bottom. The creatures are also particularly suitable as bioindicators: due to their specialisation in the habitat, they are particularly susceptible to changes such as infiltration of surface water, fertilisers and pollutants including metals and temperature fluctuations. As a result, they can provide early indications of changes in the water and in so doing make a significant contribution towards ensuring the quality of groundwater and therefore drinking water. The research team led by associate lecturer Dr Hans Jürgen Hahn of the Institute for Environmental Sciences of the University of Koblenz-Landau together with Dr Christian Griebler of the Institute of Groundwater Ecology of the Helmholtz Centre, Munich has developed a proposal for the biogeographical classification of groundwater habitats in Germany. This is the first ever proposal for a definition of ecological references for groundwater over a wide area. These may provide an important basis for defining whether the environmental status of groundwater is good. 'Binding criteria and limits for the evaluation and sustainable protection of groundwater ecosystems can only be established on such a basis,' stresses Dr Hahn. 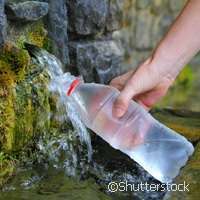 These already existed for surface water; however, studies by the University of Koblenz-Landau have shown that this classification does not hold up for groundwater. According to Dr Hahn, groundwater fauna and microbiological communities are a scientific treasure of immeasurable value. Many are 'living fossils' as they descend from terrestrial species which died out millions of years ago.